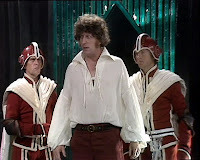 The Doctor starts this season wearing the burgundy frock coat first worn the previous year in Pyramids of Mars. The coat is double breasted in appearance, though does not function as such; has large pointed lapels; a total of 12 buttonholes on the font; and two large pockets in the skirt towards the back. He continues to wear his grey Donegal tweed trousers, brown brogue shoes, Victorian-styled shirt with stand-up collar, and bold Prince Of Wales check velvet waistcoat. Against convention the waistcoat is worn with the bottom button done up, causing it to bulge in an unsightly way (see left, second picture). He now ties his ascot cravat in the style of a full-dress ascot without a stick pin (see left, third picture). 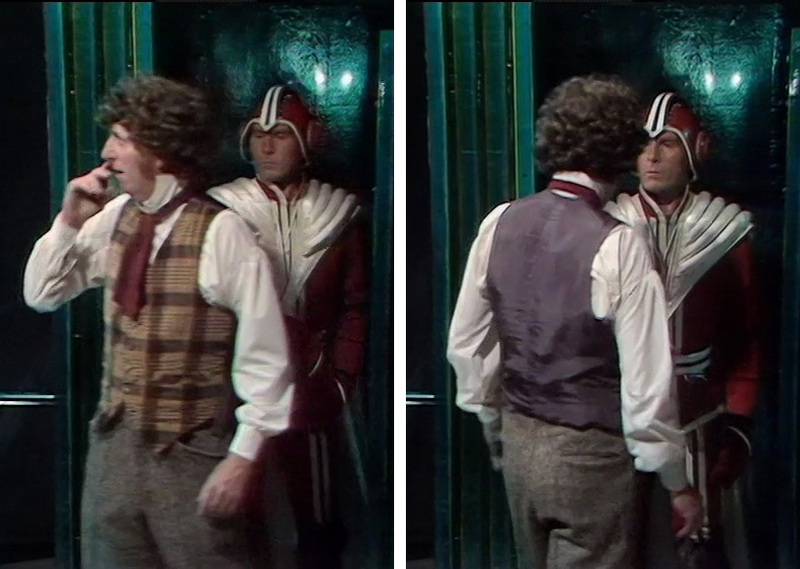 In Episode four, he temporarily wears a chest-plate over his waistcoat (see left, bottom). The trademark fedora hat doesn’t make an appearance in this serial. 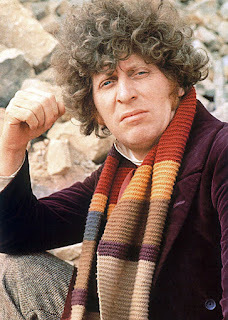 For the film sequences in Portmeirion, The Doctor wears his original scarf, which has had more sections removed from both ends, making it the Season 14 scarf. 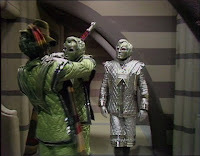 The ends easily distinguish it from the Duplicate scarf created for The Android Invasion, which is worn in the studio scenes. 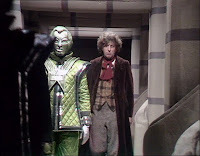 When Sarah and the Doctor enter the “secondary console room”, they find The Third Doctor’s rust-red velvet jacket from The Curse of Peladon and one of his ruffled shirts (though not a screen worn) hanging up. 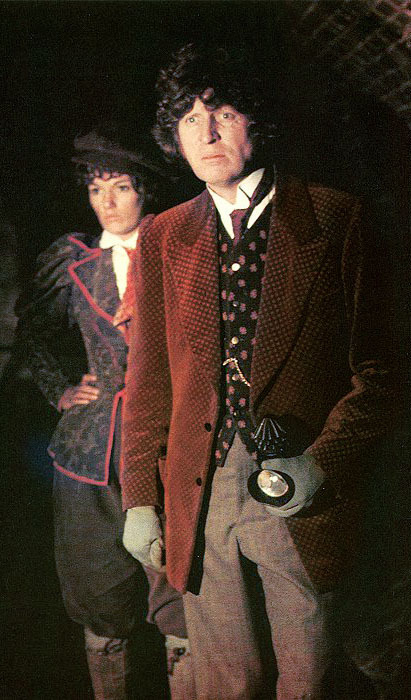 Keeping continuity with The Masque Of Mandragora, The Doctor continues to wear the burgundy velvet frock coat; velvet checked waistcoat; tweed trousers; and scarf, though in the opening scene he passes the coat to Sarah to carry and he looses his scarf while search for her in the rubble of the quarry blast. This gives us the first really good look at the waistcoat, revealing the aubergine coloured silk back. 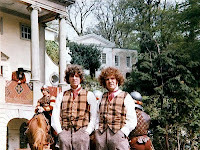 A publicity still for the episode (see above) shows up a curious detail about the waistcoat. Instead of having a fully functional strap across the back, it has one stumpy tag on one side only. Odd. The Doctor wears the duplicate scarf for location scenes, and the season 14 for the studio scenes. 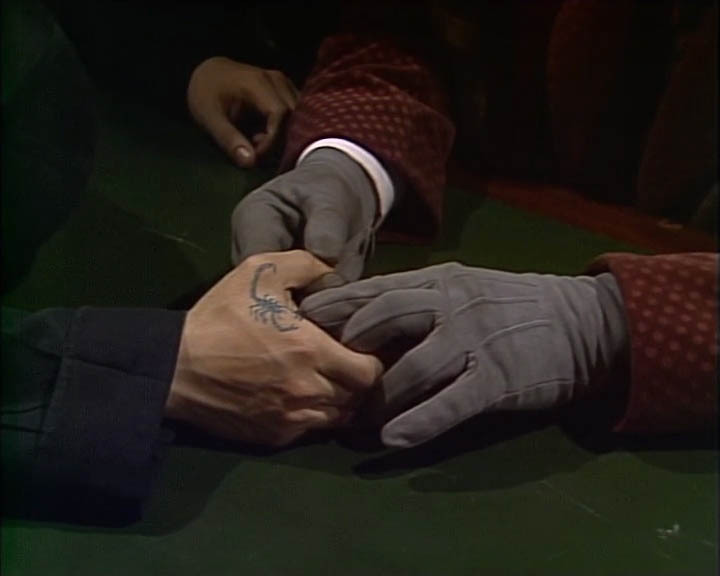 The story opens with a scene linking directly from the end of The Hand Of Fear. 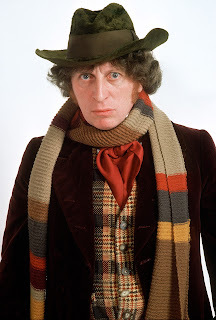 He wears the same outfit of burgundy velvet frock coat; checked velvet waistcoat; white shirt; tweed trousers; brogue shoes; with the duplicate scarf now favoured for the studio scenes. This is just worn around his shoulders and not looped around his neck as usual. Leaving his coat, hat and scarf in the TARDIS, we get another good view of the rear of the waistcoat (see above). 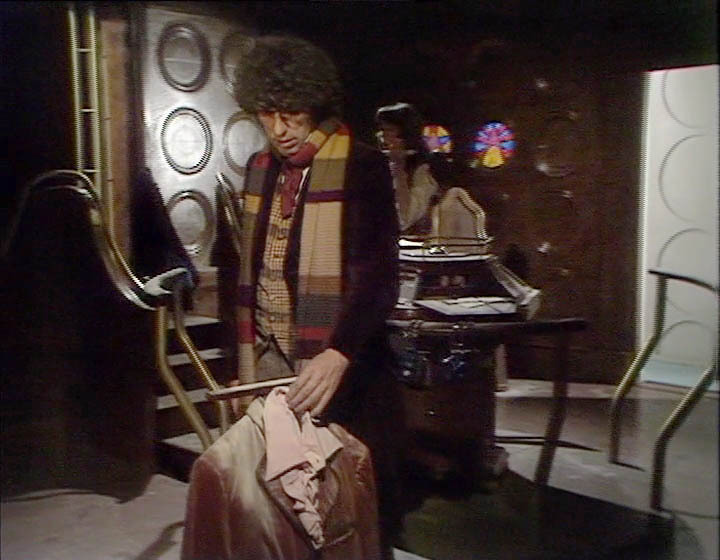 He then returns to collect his coat and scarf, only to leave them (remember that - he’s left them on a display - see above) in place of some orange Time Lord robes including ceremonial collar and skullcap, although lacking the tunic beneath (see left, top). 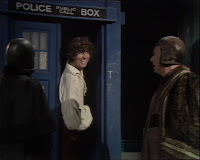 He looses the collar and skullcap as he rushes to avert the assassination attempt (see left, middle), before nearly loosing the rest of the robes early in episode two. 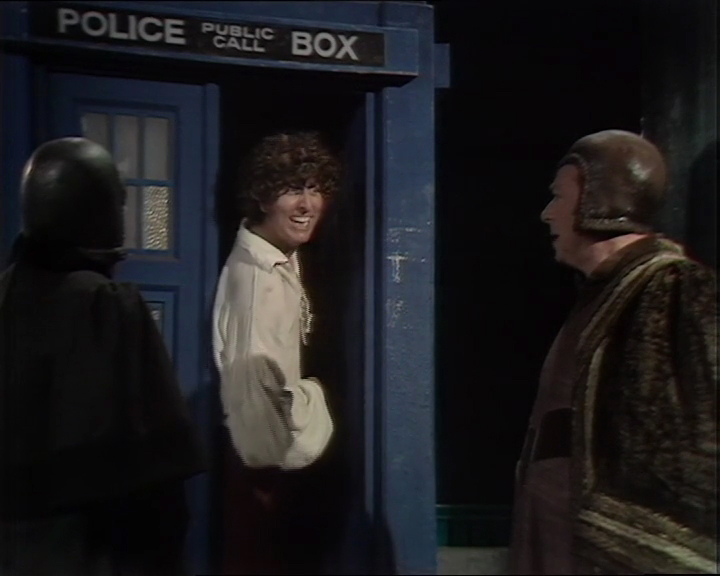 Under arrest, The Doctor is given a new costume to wear comprising of a loose fitting linen shirt with drawstring front with billowing sleeves that terminate in barrel cuffs; a pair of burgundy breeches held up with a black leather belt; and knee-high cuffed leather boots. No explanation of where these clothes come from is given. Upon entering the Matrix, he regains his Season 14 scarf, only to nigh-immediately lose it over a cliff. 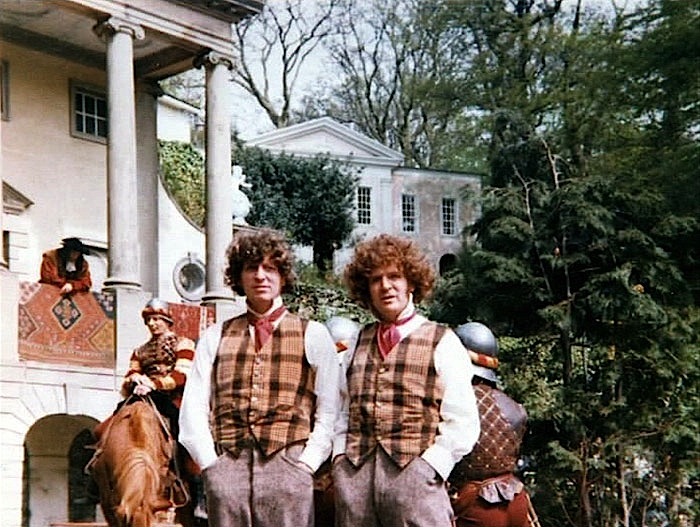 Curiously, for one scene, The Doctor’s stunt double is wearing different boots, with no cuffs and leather harness straps around the ankle (see left, middle). These are quite different to those worn by Tom (see left, bottom). Note too that the boots are a tan coloured leather. 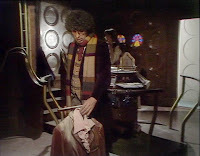 In a possible oversight, The Doctor is not seen to collect his clothes before leaving in the TARDIS. Remember he left them on that costume display? This serial is one of those landmarks for Tom’s costume, though you wouldn’t immediately know it. He appears to be wearing various parts of costumes from previous adventures, but upon closer inspection they are not all what they appear. Velvet checked waistcoat (Terror Of The Zygons), white shirt (Pyramids Of Mars), dark red cravat (The Android Invasion), bottle green fedora (The Brain Of Morbius) and scarf (see left, top and middle). The new elements are tweed trousers with a wider leg, tucked into new light brown suede cuff boots (see left, bottom). 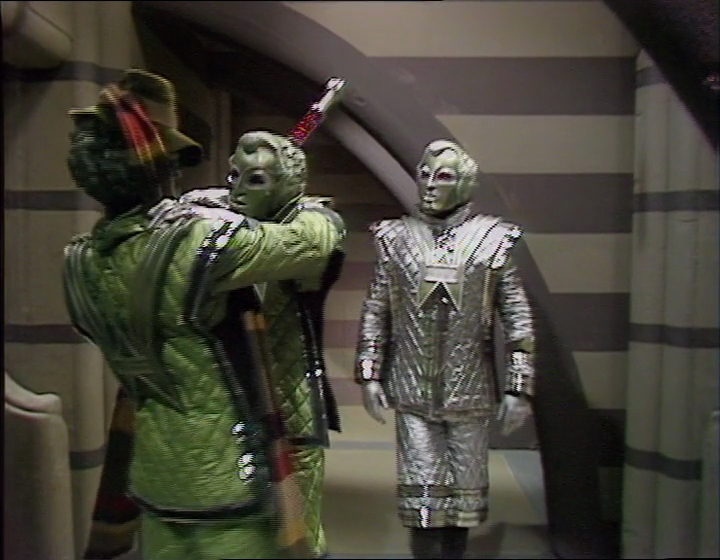 These are NOT the brown leather boots worn in The Deadly Assassin. 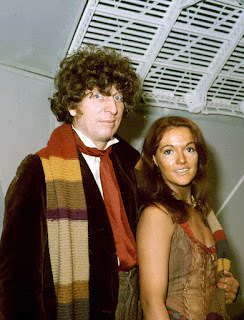 The most subtle change though is the debut of a brand new chestnut brown frock coat, not to be confused with the burgundy one worn to date. Although in colour it could easily be mistaken for the previous, this is longer, below knee length whereas all of the others are at knee length (see right, top). The position of the two outer pockets has been moved to the waistline, with disproportionately large flaps (see right, bottom). The Duplicate scarf is now worn full time, and is draped over his shoulders rather than looping around his neck (see below, left). For some brief scenes one end is flipped over his left shoulder(see below, middle), and in another both ends are draped over his right shoulder (see below, right). The serial opens with The Doctor wearing the checked velvet waistcoat; Victorian-styled shirt with stand-up collar; extra-long ascot cravat looped around his shirt collar once before being tied in a bow with short loops; grey Donegal trousers; and brown brogue shoes (see left, top). 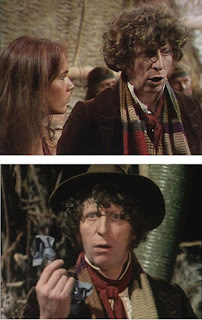 As he leaves the TARDIS with Leela, he puts on his new chestnut brown velvet frock coat; the Duplicate scarf, draped around the shoulders without looping around the neck; and rolls the bottle green fur felt fedora up, putting it in the coat pocket (see left, third picture). Also glimpsed on the hat stand are the grey tweed frock coat from The Android Invasion and the biking-red corduroy jacket from season 12 and 13 (see left, second picture). Although The Doctor carries his fedora hat, he never wears it once during the serial. Curiously for one scene in episode one, The Doctor is seen without the scarf (see below), then without explanation regains it the following scene. 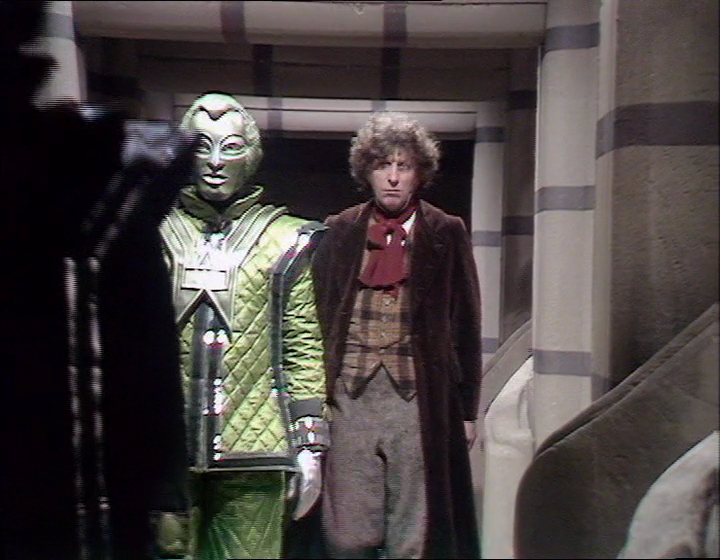 In episode four, The Doctor disguises a robot with his scarf and hat (see left). Odd as he’s not at any time worn the hat. Unseen, he regains them before the end of the episode. 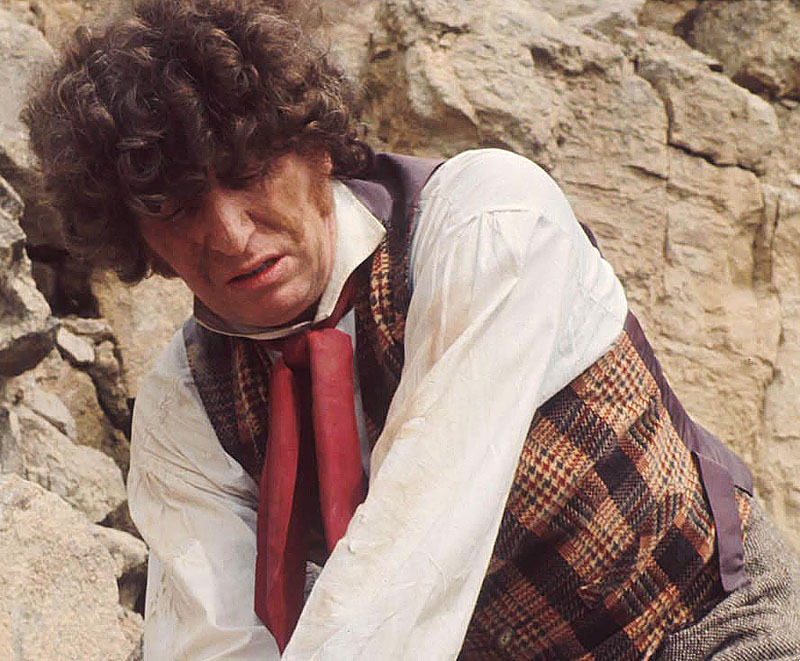 For the first time ever in the history of the series, The Doctor wears a period-appropriate costume. Until now he always wore his own style, regardless of the time and places he visits. The Sherlock Holmes inspired outfit comprises of tweed inverness cape; deerstalker; red jacket velvet jacket; velvet waistcoat; white shirt; dark red tie with burgundy polka dots; grey-green trousers; black ankle boots with grey spats; and a pair of grey gloves. 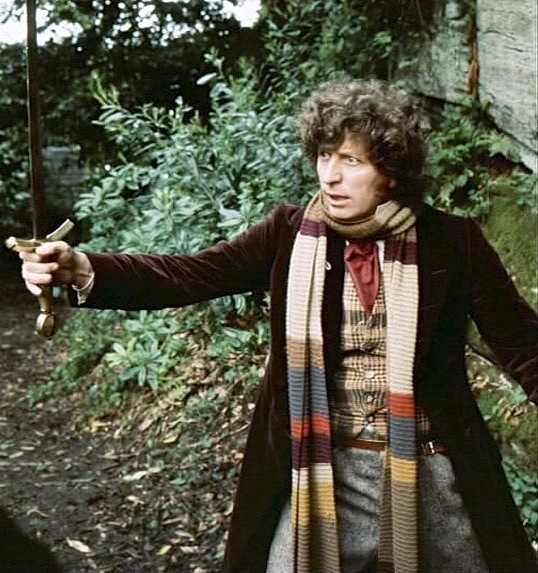 Towards the end of episode one The Doctor looses his Inverness cape before entering the sewer, collecting it on returning to the street level in episode two. The costume itself is very fancy and quite luxurious on every level. The Inverness cape is of mottled brown tweed with large orange, black and tan check appliquéd on it, and trimmed with grey braid. It is lined with a multi-coloured paisley silk. The neck is closed with a top button (done up in a couple of scenes) with a fabric toggle over the top. This is sometimes hanging from one side or the other, and in some scenes is missing. 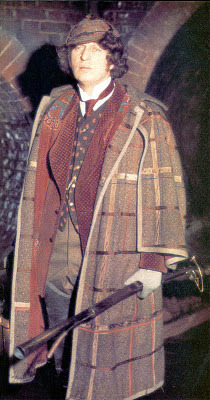 The paisley-lined cape is a single piece, unlike the winged Inverness capes of the Pertwee era. Underneath he wears a red velvet lounge jacket with a polka dot pattern and wide peaked lapels; a black velvet waistcoat with a floral pattern and gold buttons; butterfly wing collar shirt, the collar attached with studs; a red tie; a deerstalker cap; grey gloves; grey-brown trousers; and black leather ankle boots with grey spats. This is the only serial the Fourth Doctor does not wear his trademark scarf for any scene. Apparently the scarf was originally meant to be included in 'The Talons of Weng Chiang' but was dropped because they felt the SH costume was enough by itself. Your comment under "The Talons of Weng-Chiang" is incorrect. The Doctor HAS worn period clothing before. In the S1E8 episode "The Reign of Terror", he wore a costume in line with the French aristocracy of the time period (1790's France) of the episode.